A New Fridge is On the Way! With any luck, today was the last day we will be living with a dorm size refrigerator in our entry way! After posting last week about our refrigerator troubles, we decided to try reaching out to Sears via Twitter to see if they’d be better able to help us via that channel … and they were! After providing our information so our account could be reviewed by a “member experience manager”, we heard back yesterday that we’d been approved for a replacement refrigerator … and it’s being delivered tomorrow morning! While the last four weeks have been full of frustrations in getting the refrigerator fixed, we’re so, so happy that the end is almost in sight. I, for one, am looking forward to buying whole gallons of milk again! We started some refrigerator shopping this weekend to replace the one that died on us a few weeks back. We also prefer a french door style refrigerator with bottom freezer. You wouldn’t think this would be all that difficult, but there are seriously only 3 fridges out there that meet this criteria … and none of them are ideal. The newer version of the Kenmore Elite fridge that just died on us after less than 4 years. Unless Sears provides one for free as a replacement for the broken one (which would be great! ), we’re not so excited about spending money on another of these for obvious reasons. A Samsung, which we ruled out before even looking at because there are basically no Samsung repair technicians in our area other than Sears Home Services. Again, we’re not so excited about that for obvious reasons. A Kitchen Aid. This one is just ok. I’m not crazy about the stainless steel handles on the black fridge, but I could get used to it, I think. The bigger thing is that the ice maker takes up a huge chunk of real estate inside the fridge and there’s also no spot for a gallon of milk in the door. I just don’t think I’m willing to pay a premium for such a small amount of usable refrigerator space. 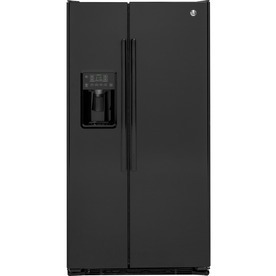 So, today, we shifted the search to black, counter-depth side-by-side refrigerators. There seems to be a few more options available for side-by-side, but choices are still pretty limited. I guess no one likes black? I’m not sure. Anyway, as of right now, we’re looking at this GE. We figure it would do everything we need and, although I prefer the french door style over side-by-side, this one actually has more cubic feet of refrigerator space than the Kitchen Aid, plus none of that space is used up by an ice maker, so I think we’d probably find it more useful overall. Anyway, that’s were we are as of tonight. We have some more research to do and we’ll probably stop at a couple more appliance stores to see if we can actually see any of our options in person before ordering online. In the meantime, Sears has responded to my last blog post requesting our information so they can “review our account”. We are still awaiting their response. Hopefully they will stand by their product and do the right thing in supporting their warranty. Three weeks ago, our refrigerator died – and we are STILL working to get resolution. I never imagined we’d be this far in and still feel like we are at square one. Someday we are going to look back at all of this and laugh … someday, but definitely not today. We definitely expected more when we purchased a Kenmore Elite refrigerator. It seems ridiculous to us that we have had multiple issues in less than 4 years since we purchased the refrigerator with what seems to be a poor product with little reliability, combined with poor customer support from Sears. Based on what we’re learning through this experience, it is fairly obvious that the practices and response we are seeing from Sears are intentional and a decision they have made about how they want to manage their customer relationships. It is disappointing … and frustrating … to say the least. Our (now-dead) refrigerator is less than 4 years old. It is a Kenmore Elite Counter Depth French Door Refrigerator. (Model 795.72049.110). It’s a slightly older version of this one which is Kenmore branded but manufactured by LG. The refrigerator we used to love. We really liked the refrigerator – it had a nice set of features that worked really well for us. The first refrigerator we had, though, lasted only a few months before having enough issues that Sears replaced it with a new one. And now we’re having troubles again – not sure if this model is something of a lemon or if we’ve just gotten “lucky”. Anyway, all was good until Labor Day when we woke up to milk that was somewhere in the middle of culturing itself into yogurt and a refrigerator that was no where near cold enough. Monday, Sept 7 (Labor Day) – The refrigerator failed. 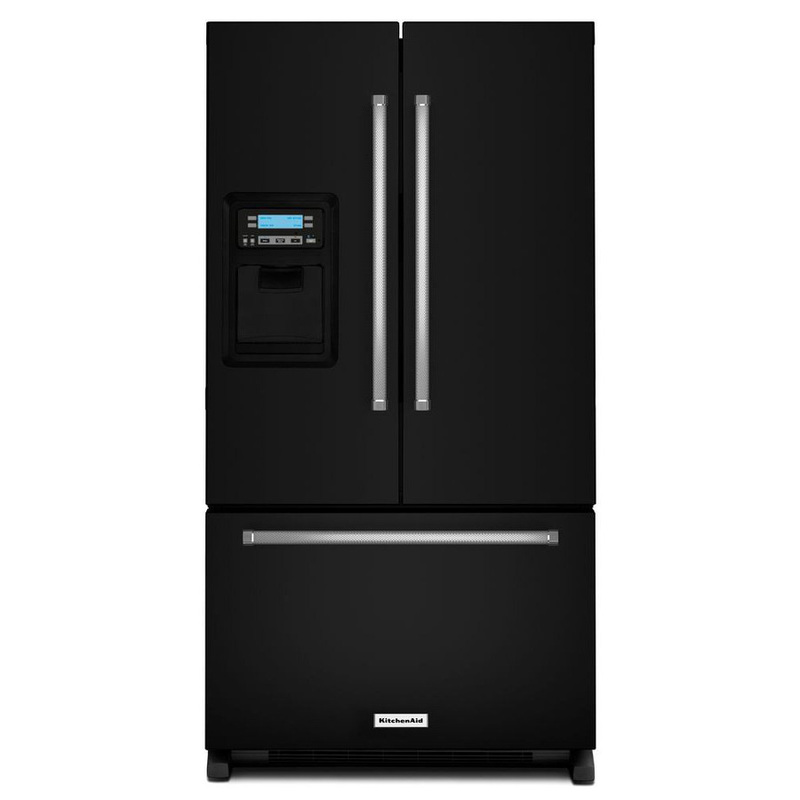 Tuesday, Sept 8 – Thinking the fridge should still be under warranty, I called Sears Home Services for a repair appointment. Their next available date was Friday, September 11th (which I’ve since learned that getting them here within a week was faster than the norm). Friday, Sept 11 – A&E Factory Services technician (dispatched by Sears) came to repair the refrigerator. He checked the compressor, said it was running fine and vacuumed the dust from the coils saying they were probably just too dirty for the refrigerator to function properly. Charged us for preventative maintenance ($84.99) and said to call back if that didn’t fix the problem. Also said the fridge was out-of-warranty, stating that it only came with a 1 year warranty. This did not seem like it would fix the issue but I trusted him. Refrigerator temperature started increasing within a couple hours of the technician leaving, so I scheduled another service call through the Sears Home Services website. Their first available appointment was Monday, September 21. Monday, Sept 14 – I called Sears Home Services to see if they could do anything to get us an earlier appointment time considering that they’d already been out once and failed to fix the problem. They added us to their “emergency list” (meaning we could get an earlier time if there was a cancellation before the 21st), but could do nothing more. Tuesday, Sept 15 – Having been told by Sears that our refrigerator was no longer under warranty and not wanting to wait another week, I called the only other repair shop we could find in our area that is certified to service LG appliances. They were able to come the same day for a “priority” service charge that was only $5 more than Sears’ standard service charge. Their technician inspected the refrigerator and found evidence of a “sealed system leak”. Total cost for the repair (including a new compressor, 2 new evaporator fans, and ~3 hours of work) was estimated at $729. He was also certain that the sealed system should still be covered under warranty and advised us double-check that. I verified in the owners manual that the sealed system was indeed still covered under a 5 year warranty. Kenmore & Kenmore Elite appliances are purchased from the original manufacturer (in our case, LG) without the manufacturer’s warranty. Kenmore then provides their own warranty. One condition of the Kenmore warranty is that all work relating to a warranty claim be completed by a “Sears Technician”. A “Sears Technician” is anyone who is sent on a service call that was scheduled through Sears Home Services (either through their website or by calling their 1-800 number). In our area, most Sears service calls are completed by A&E Factory Service (which is an appliance repair company owned by Sears). Any overflow work is sent to the same appliance repair company I had called (i.e., they are a Sears sub-contractor for appliance repair). The technician that had been to our house that morning to diagnose the sealed system leak was not authorized to perform the warranty work for our refrigerator because I had called them directly to schedule our appointment. Had he been dispatched to our house as the result of an appointment scheduled through Sears Home Services, he would have been able to complete the work under warranty. Also, somewhere in the midst of talking to about 5-6 different people at Sears/Kenmore to request that they allow our warranty work to be completed by their “overflow provider”, the appointment I was holding with Sears Home Services for September 21st was cancelled. By the time I realized that the only way to use our warranty was through a Sears Home Service appointment, the next available time I was given for a Sears technician to come out and re-diagnose the issue was September 30th. Pay $729 out of pocket to have the other appliance repair company fix the refrigerator. Their estimate was that they would receive the parts and be able to install them during the following week (Sept. 21-25). Take the September 30th appointment with Sears Home Services and accept that we would likely not have a functioning refrigerator for 6 or so weeks (including the time to order parts and the lead time for a follow-up appointment to install them) in order for the repair to be completed under warranty. We chose to pay for the repair out of pocket. Monday, September 28 – The technician came back to install the parts and fix the refrigerator. He spent about 3 hours; the fridge was cooling when he left. But, Shortly after that it quit working again. Tuesday, September 29 – By morning, the refrigerator and freezer compartments were both just a few degrees cooler than room temperature. I called the technician back to take another look. After adding a dye to the coolant and inspecting all of the new connections, coils, etc. with an ultra-violet light, it was determined that the sealed system leak was likely located in the cabinet of the refrigerator in an area that was not serviceable. 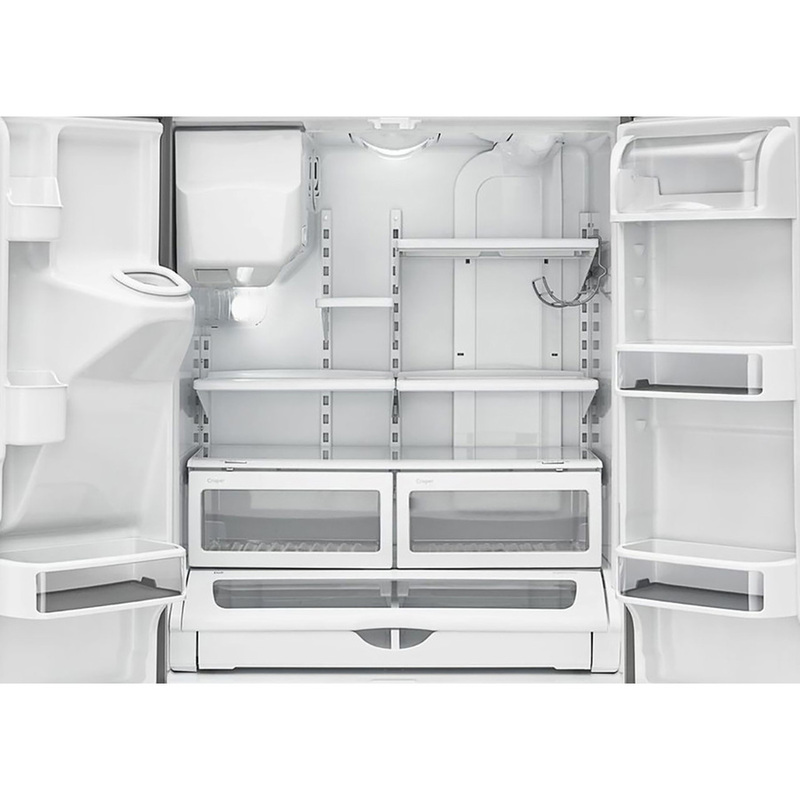 In this case, our Kenmore warranty would cover replacement of the refrigerator. The service technician tried calling Kenmore, but was told no warranty claim could be placed because he did not have a Sears service order number (which is assigned when an appointment is scheduled through Sears Home Services). I then called Sears Home Services to schedule a service call, requesting that it be scheduled with the “overflow provider” for our area (i.e., the same company that had already been working on our refrigerator). The person I talked to said that would not be a problem, put me on hold for about 10 minutes, and gave me an appointment time for the following day. This seemed perfect because it would allow us to use the Kenmore warranty without having to start over diagnosing the problem with someone from A&E Factory Service. Wednesday, September 30 – The appointment that was supposed to have been scheduled with the overflow provider had actually been scheduled with A&E Factory Service. When the technician called to tell me he was coming, I explained the situation and that I was expecting someone different. He verified that he would, in this case, have to start over in diagnosing the issue with the refrigerator – working with LG technical support, running multiple tests, and maybe replacing some parts before the refrigerator would be deemed un-repairable and replaced. Instead, he suggested that I call a Sears customer support 800 number that he gave me, which would let me talk to a US based call-center that would likely be able to help me get my service order re-routed to the appliance repair company we’ve already been working with so that the claim could be filed right away rather than going through all of the trouble-shooting steps again. I called the 800 number and spoke to a couple of people who spent some time trying to figure out how to direct a service order to the overflow provider so that they could complete the warranty claim based on the work already completed, but they were unable to do so. In the end, I was told I just needed to go through the steps with a Sears technician again. They did add some notes to my service order to let the technician know he should call another 800 number to explain the situation and maybe bypass a few steps usually required to classify an appliance as “unrepairable”, but no guarantees. They then called my service technician and left him a message to come out to our house today and make that phone call to get the process started for us. I did not hear from the technician again and he didn’t show. So, as of right now, we are 3+ weeks in and $814 out of pocket ($85 for the initial visit from Sears Home Services and $729 for the repairs made by the other company) … and we’re at a point where we basically need to start over with a Sears technician if we want to take advantage of the Kenmore warranty on our refrigerator. That equals probably another month or two without a working refrigerator. We are beyond frustrated. I get that we didn’t follow the “standard” process for warranty work with Sears Home Services – because we weren’t willing to accept their wait time for each appointment. We were even willing to pay for the $729 repair out of pocket in order to get the refrigerator up and running sooner. Now that we’re finding out that the refrigerator can’t be repaired, though, it totally frustrates me that we can’t make use of any of the work that’s been done already in filing the warranty claim, resulting in us needing to start over. I mean, seriously – the hang up here is a technicality around who called Sears’ “overflow provider” to come work on the refrigerator … which seems like it should be such a small thing, but will add at least a month to the timeline. What we’re finding, though, is that Sears has structured their whole repair business without the best interests of their customer in mind. They aren’t willing to do anything to shorten the lead time needed for scheduling a service call (even though I’m able to call their “overflow provider” directly and get someone here MUCH sooner … so it isn’t a supply and demand problem) and they aren’t willing to work with me now to allow their “overflow provider” to file a warranty claim on my behalf. Like we said, we expected more.